Teacher Corps is for the engagement of 500,000 unemployed graduates in the following areas: N-Power Agro, N-Power Health, N-Power Teach, N-Power Community Education. The name says it and you'll know which area would best suit you. Age bracket is between 18 – 35 years old. Click here for step by step guide on how to log in and take the test. 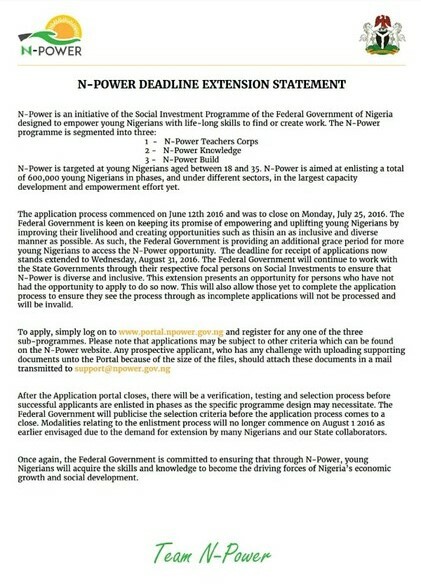 If you made mistake or submitted wrong information when you registered for npower or you have issues with uploading your credentials or you can not upload your CV, please go to their Facebook page http://facebook.com/npowerng/ and drop your email, or send your details to support@npowerng.gov.ng you will be communicated. Click here to view the full statement on the extension of registration deadline. Some applicants are already receiving their registration number having submitted on earlier . If you're facing the same issue, please be patient and keep checking your inbox and AND ALSO your spam folder for any updates. 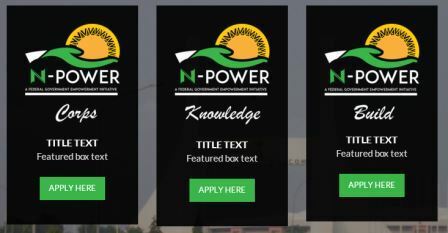 2) You're taken to the homepage with the following headings: N-Power logo, N-Power YouTube Tutorial, N-Power Needs You, and Programs. 7) Clicking on more will list N-Power agro, Health etc, click on N-Power agro. Apply means you need to register first so go to the next step and create an account. You will be required to supply the following information to create the account: Username, valid email address, password. If after supplying username, email, password you click on register and you're told: YOUR USERNAME AND EMAIL ADDRESS IS ALREADY REGISTERED. It means your registration is already recognized. Don't worry, scroll down and click on LOGIN using the same username or email and your password, You'll get access to the portal. 12) To login, go to where you saw “REGISTER” but this time, do not click register, you will see “LOGIN” under it, click on it. 13) After successful login, you will see “STEP 1 of 5”. 14) That's the stage you'll have to provide the necessary Info about you including your qualifications. 15) If your passport is rejected, resize it with Paint application on PC. Open the passport with paint application, click CONTROL+W on your keyboard, you will see option of resize by percentage or pixel, click on pixel, change the number in horizontal to 132, vertical to 170, click ok and save the new size, you are good to go. N*B: If the box is not allowing you to input the number, untick the box that has *maintain aspect ratio*, input the 132 and 170 then save. 16) After you're done, click on Submit. That's all, you'll be contacted, but be patient. For N-Power knowledge and N-Power build, when you sign in their links are missing. This links are to be used after you have signed in. Just follow the guide, it is easy. Register, choose your focus area and upload the documents. The site is not even working. Recently the site has been opening without the login or register features. If you have filling the form without log in, you may need to do it again when the site is fully functional again. Many people are still waiting for confirmation cos the first set of people that registered have started receiving email confirmation. Nothing actually, your documents and information are being reviewed, next stage will be communicated to you through email. Remember they have to spread it throughout the country so your residence is also important. If you made mistake or submitted wrong information when you registered for npower or you have issues with uploading your credentials or you can not upload your CV, please go to their Facebook page http://facebook.com/npowerng/ and drop your email, you will be communicated. Greetings. I registered the very first day the site was lunched and I received a unique number then the site crashed. Is that application still valid?